When the casket reached the front of the sanctuary, there was a loud cracking sound as the bottom fell out. And with a thump, down came Father Iggy. 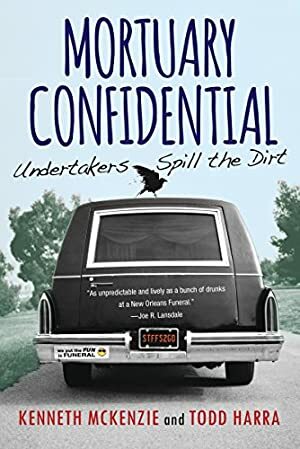 From shoot-outs at funerals to dead men screaming and runaway corpses, undertakers have plenty of unusual stories to tell -- and a special way of telling them. In this macabre and moving compilation, funeral directors across the country share their most embarrassing, jaw-dropping, irreverent, and deeply poignant stories about life at death's door. Discover what scares them and what moves them to tears. Learn about rookie mistakes and why death sometimes calls for duct tape. Enjoy tales of the dearly departed spending eternity naked from the waist down and getting bottled and corked -- in a wine bottle. And then meet their families -- the weepers, the punchers, the stolidly dignified, and the ones who deliver their dead mother in a pickup truck. If there's one thing undertakers know, it's that death drives people crazy. These are the best "bodies of work" from America's darkest profession. "Sick, funny, and brilliant! I love this book." Track It. This book has been £2.34 within the past year. Log In to track Kenneth McKenzie on eReaderIQ. to be notified each time the price drops on any book by Kenneth McKenzie. to stop tracking Kenneth McKenzie. Log In to track Todd Harra on eReaderIQ. to be notified each time the price drops on any book by Todd Harra. to stop tracking Todd Harra. We started tracking this book on January 29, 2012. This book was £6.40 when we started tracking it. The price of this book has changed 105 times in the past 2,640 days. The current price of this book is £5.69 last checked one hour ago. This lowest price this book has been offered at in the past year is £2.34. The lowest price to date was £1.89 last reached on February 8, 2016. This book has been £1.89 2 times since we started tracking it. The highest price to date was £8.86 last reached on March 3, 2013. This book has been £8.86 one time since we started tracking it. We last verified the price of this book about one hour ago. At that time, the price was £5.69. This price is subject to change. The price displayed on the Amazon.co.uk website at the time of purchase is the price you will pay for this book. Please confirm the price before making any purchases.